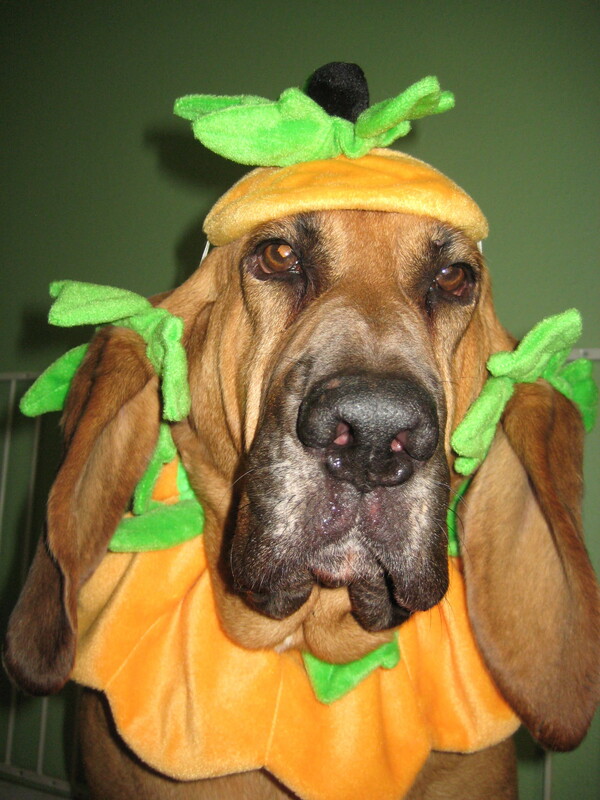 Warning, if you are not a Bloodhound person DO NOT read this blog post. But if you are a hound person, read on! This post is all about ears. My Frankie is a prolific digger of holes. She loves digging. A hole to China? Give her an afternoon. I only wish I could harness that energy and direct it, maybe have her trench a line to lay cable or something. Alas, instead I find myself constantly leveling those holes so I don’t trip and injure myself. But here’s the thing, there is NEVER enough dirt refill them! Where does that dirt go? Specifically, her earth-caked right inner ear (though the left one gets filthy, too). First official HOUND DOG EAR question: Why is her right ear ten times dirtier than the left? 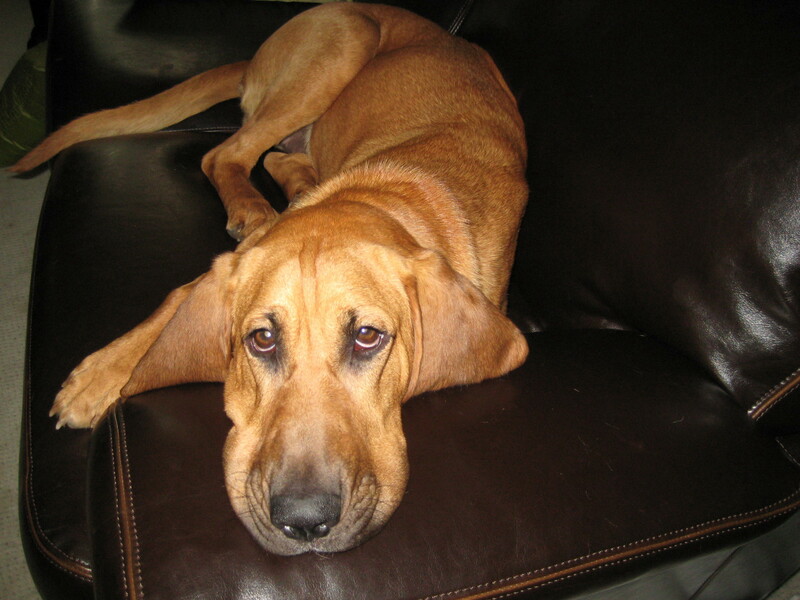 Does your Bloodhound have one “dirtier” ear? Which brings me to my NEXT ear query… starting with eye goobers. You know the eye goobers. Icky slicks of “sleepers” seeping down her snout. They’re not anything to be alarmed over, and I try to keep tissues handy at all times to gently wipe them away, BUT occasionally no tissues, shirt sleeve or napkin is available and I improvise. 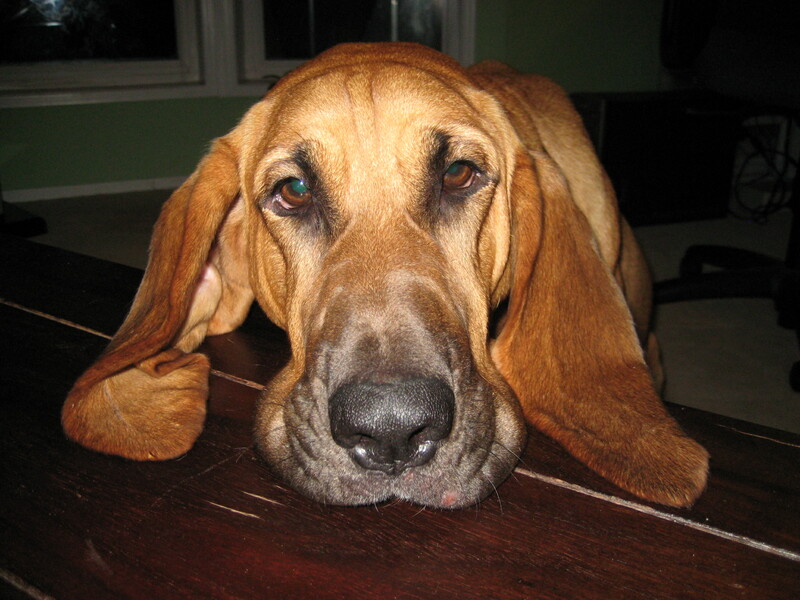 Specifically, I’ll take the ends of Frankie’s long, lovely, dangly Bloodhound ears and wipe away the eye goober. Yes, I’m a little grossed out by my actions, but I’d like to know if any other Bloodhound owners improvise in the absence of a tissue. Finally, when your Bloodhound is sleeping, do you sometimes tip toe over and flip back her ear for better air circulation in there? I do! Is this normal? Welcome to random Wednesday. I have no theme, no direction, and no plan for my post today… other than I’m just going to write what’s been goin’ on. Snow cancelled mini-vacation to coast with hubby. Bummer. We made the best of the situation by turning off computers, drinking sparkling wine from Trader Joe’s, and renting movies. Ate pizza, too. The next day we went out for Chinese food. My fortune cookie fortune reads: “A new pair of shoes will do you a world of good.” The Universe has a warped sense of humor. Shoes?!? Who is writing these things and why did I get that fortune? On Saturday, a couple driving an SUV honked at us, then began waving wildly. Did we have a flat tire? Was our muffler falling off? My husband pulled over. The people rolled up beside us and asked if we needed our front fender fixed. Cheap. Really cheap. My “accident” happened in September, at a garage sale (of course! ), when I clipped a curbside basketball hoop. The basketball hoop was fine, but the dent above the front wheel? A little larger than a gravy boat. After we emptied our wallets, and scraped up the coinage in the console, this guy popped the dent with a rubber hammer and polished it up for $27. In the parking lot. In the rain. The tire went flat on Sunday. Two screws. In different spots. Darn. On the bright side, my husband dealt with it. 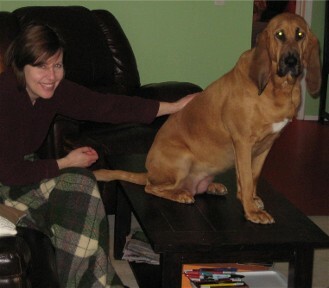 I still love my Bloodhound even though she ate my best pair of winter gloves. My right glove has a big CHOMP at the wrist. I met a man who needed my lighted, animatronic flamingo more than I did. “Mingo-Clingo the Flamingo” has been re-homed. Can I teach him to type? Now, off to go shoe shopping because my fortune demands peep-toe stacked pumps. Just kidding. But maybe I’ll buy a new pair of leather gloves if I can’t fix the ones I have. How’s your week? This is me and my husband having fun on Kindle… with our dog. 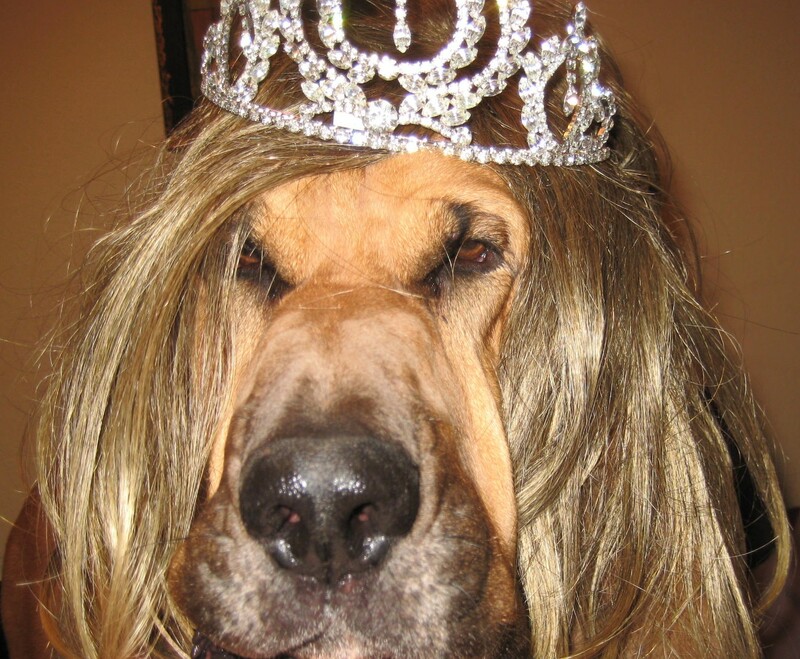 Introducing THE WISDOM OF THE BUDDHIST BLOODHOUND featuring our very own Frankie Rose. Not only is she incredibly photogenic, but just look at that face. You can tell there’s a lot of deep thought going on between those oh-so-long ears! This book is a humorous introduction to the basics of Buddhism according to Frankie the Bloodhound – debut author, kitty enthusiast, and seeker of higher thought. She has compressed thousands of years of spirituality into 39 nuggets of wisdom (with full-color photos) in this unique canine interpretation of enlightenment that will delight dog lovers as well as readers on the trail to greater awareness. Who would have guessed that the high-strung Bloodhound we adopted four years ago off Craigslist would make her literary debut on Amazon? My husband and I had a big fight in the parking lot of Walmart. Over a garbage can. He wasn’t my husband back then. We’d only just moved in together (2001) and in the process of “nesting” I busied myself with vanquishing his bachelor ways. As a newly-minted couple, this was our first big blowout. I’d crossed the line when it came to the kitchen garbage can. Years later, that very garbage can rears its ugly head… in a book my husband is writing about Buddhism. I’m trying very hard to lead a more aware and enlightened life, so editing the final draft I’ve had a chance to reflect. Some aspects of Buddhism come naturally, others I need to keep working on. During a garage sale last summer a neighbor racked up $25 worth of bargains and promised to pay me later that day. You can guess how that turned out. Not a dime. Seven months later, my keen sense of dog poo timing means every time I take my Bloodhound out for a walk she somehow manages to “lay timber” in this neighbor’s yard… where I’ve NEVER picked it up. Coming home from a Portland Trailblazer’s game I got on the wrong train. I wound up heading in the wrong direction, changed trains, and somehow found myself STILL on the wrong train and heading to the airport late at night. By now, the once fan-packed cars were empty. Except for me. And a young Hispanic guy who was bleeding. His knuckles were a crisscross of open wounds. He sat directly across from me and stared. I wanted to say something, but really, what could I say? I felt a little scared, too. He looked angry. I finally thought of something I could do to help him. My friends tease me about being such a girl scout, prepared for anything. In my wallet I carry a half dozen bandages and some first aid cream. Digging through the folds of my wallet, I fished out my medical supplies. I leaned forward, held out everything I had and asked him if he needed help. What happened next surprised me. His eyes filled with tears and he hurried off the train at the next stop. Not a word spoken. Compassion came naturally to me that night and it doesn’t in other situations. Like with dog poo. Logically, I know I need to cut out this passive aggressive Sh%^ (literally!) and stop judging the neighbor, but as I edit the pages of my husband’s book I’m left wondering if a fight over a garbage can in the parking lot of Walmart was what actually set me on the path to enlightenment… as slow and gradual as it might be! Jamie Brazil is the author of the contemporary romance, Prince Charming, Inc. and a coming-of-age novel, The Mayan Sisterhood.